Antique Silver Hallmarks and how to indentify where your silver comes from. Antique silver hallmarks have been used to control the quality of goods made of silver since the 14th century and the organisation that regulates the craft, Goldsmiths Hall, gave the world the term hallmark. Every item made of silver must be sent to an Assay Office for testing. This is to ensure it is of the required sterling silver standard and, provided it conforms to a standard, a series of symbols are stamped into each part of the item. Today and for the past few centuries, this stamp or silver hallmark has shown the place and year of manufacture of the assayed silver item, as well as the silversmith who made or sponsored the item. The laws governing silver hallmarking are very strict and if an item does not comply with a standard the item will not be hallmarked and will probably be destroyed. A false silver hallmark has always been treated with the utmost severity by the law and in the past a silversmith was pilloried for their first offence, where they would be pelted with rotten fruit and vegetables. If they offended again, a limb would be hacked off and, until the 1720’s, the death penalty was the usual sentence meted out to persistent offenders. There was a simple reason for this seemingly Draconian behaviour in that the manufacture of silver and gold was allied to the minting of currency. Therefore, by debasing silver or gold, the offender was undermining the coin of the realm. A treasonable offence in times when treason was punished by death. 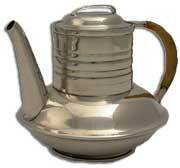 From 1696 to 1720 the standard of silver was raised from 92.5% to 95.8% pure. It was denoted by the figure of Britannia and the lions head erased. Sometimes called the Sterling Mark, the lion passant, the mark for Made in England, first appeared on English silver and gold in 1544. For two years it was crowned, but has been struck ever since in its present form by all English Assay Offices. The first London silver hallmark to be used was the leopards head, in the year 1300. In that year, a decree by Edward I laid down that silver or gold could not be made or sold unless it was marked by the leopard’s head or The King’s Mark, as it was then known. This mark became crowned in 1478 and remained crowned until 1821. Since 1821, the uncrowned leopard’s head has remained as the distinguishing mark of London. Used from the inception of the Sheffield Assay Office in 1773 , the Crown was the town mark of Sheffield. Because of possible confusion with the Crown mark used after 1798, (as the hallmark for 18ct gold), the Sheffield assay mark was changed on January 1st 1975 for a rose. Which had incidentally, been used as the gold assay mark for Sheffield when the Assay Office was first entitled to test gold, after March 1st 1904. Between 1708 and 1853 the crown is often incorporated with the date letter struck on small objects. When the Birmingham Assay Office was established in 1773, largely due to the representations of the great Midlands industrialist, Matthew Boulton, the mark of an anchor was adopted as the town mark. By tradition, it is said that Birmingham and Sheffield tossed for the marks derived from the sign of the Crown and Anchor tavern in London – where the promoters of the two new offices met. On the occasion of the Assay Office’s bicentenary in 1973, Birmingham struck a special anchor with a ‘C’ on either side of the stock, to indicate two hundred years. Scottish hallmarks have been regulated by statute since 1457 but the earliest known example dates only from 1556 to 1557. The Incorporation of Goldsmiths of the City of Edinburgh was thought to be in the 1490’s and the earliest surviving records date from 1525. The hallmarking of Irish silver began towards the middle of the 17th century. The mark of origin is the Harp Crowned and it appears with a date letter and maker’s mark. In 1731, the figure of Hibernia was added. Today, collecting Antique Silver is a very lucrative pastime, which can be taken up by anyone with a little bit of time and money. Simply learn to recognise those Antique Silver Hallmarks. Learning how to define the origin of a piece of silver, the year made and the silversmith is great fun and also a way of perhaps finding a rare item that was made in a particular year or city.